Chris Hemsworth (Kirk’s father in J.J. Abrams’ Star Trek) makes for a charismatic young god of thunder. He begins the story brash and cocky, and while his journey from douchebag to hero seems rather sudden, I think that’s more a fault of the run time (114 minutes to fit in almost 50 years of comics continuity) than any shortcoming of the actor. He certainly has the physical cut for the role, with his bulging blue eyes and piercing, sparkling muscles. Umm, no…waitaminute, reverse those. Anyway, he’s charming AND arrogant and I can’t wait to watch him interact with Robert Downey, Jr. in the upcoming The Avengers. The rest of the cast is serviceable. Natalie Portman. Stellan Skarsgard. Jaimie Alexander. Clark Gregg reprises his role as S.H.I.E.L.D. Agent Coulson from the Iron Man films, and he’s just as loveably smarmy as ever. The casting of Idris Elba as the badass sentinel Heimdall was controversial (what isn’t when it comes to internet fans), but he was pretty amazing. Not for one second did his ethnicity seem out of place or inconsistent with the world being created. And of course Anthony Hopkins as Allfather Odin, King of the gods, seems like it would be a no-brainer. But his track record of late has been kind of hit or miss. He could easily have just chewed the scenery here and played it all so over-the-top that it would’ve been laughable. As much as I love him, I’ll admit I feared the Odin eating somone’s liver with a nice chianti scene when the casting was announced. But he was properly Shakespearean here as the old king and father dealing with two ambitious and headstrong sons vying for the throne. Which brings me to who *I* thought was the standout among the cast: Tom Hiddleston as Thor’s brother Loki. Again, a character that could’ve been played as nothing more sophisticated than the mustache-twirling villain from an old silent movie. But instead we got a complex and conflicted young god who loves his father and struggles to earn his respect. His sibling rivalry with Thor is revealed slowly and subtly, I thought. And the progression of his trickster god mischief into outright Machiavellian evil is spurred organically by revelations made about his true nature over the course of the film. The scene of him confronting Odin angrily, with rage and tears, which then shifts into what I believe was at least partially genuine concern when his father collapses on the stairs… well, I adored that whole scene. I could happily watch an entire film of nothing but the family drama, the tension, the machinations of Loki. If someone wants to pay Tom Hiddleston to channel the Bard-via-Loki Liesmith for two hours they’ve already sold at least one ticket. I admire what Marvel is trying to do with their films in recent years. The idea of crafting a shared universe across multiple film franchises is ambitious and, until tonight, one that I thought would most likely fail. Thor is the first link in that chain to introduce concepts of magic or cosmic powers to the celluloid Marvel universe, and thus stands every chance of coming off as ridiculous and too far removed from the more “realistic” superhero fare of men wearing ultra-high tech battles suits and scrawny scientists turning into irradiated monsters. But I’ll be damned if Branagh’s version of the gods of Asgard, frost giants, and technomystical interdimensional rainbow bridges doesn’t seem as if they could easily coexist with the Stark Industries and the WWII super soldier projects. The special effects here are more hit than miss. Naturally the majority of effects shots involved the Shining Realm of Asgard, home of the gods. AJ and I were both skeptical to say the least when the first footage of Asgard began appearing online. But I’m happy to say it worked pretty damned well. The city is grand and ostentatious as only a race of pandimensional warrior gods could make it. The pinnacle of the Asgardian set pieces is undoubtedly Bifrost, the mythical Rainbow Bridge that allows the Asgardians to journey to the rest of the Nine Worlds. In the comics it’s always been illustrated rather simplistically as a flat, boring bridge that just happens to actually BE a rainbow. On screen it actually becomes a shining, crystalline causeway leading from the city proper out to Heimdall’s observatory, where he stands watch over the cosmos. From the observatory the bridge “extends” as a beam of energy that transports the travelers to and from the other worlds via wormholes. Oh, and apparently the energy beam portion of the Bridge, if left “switched on” to a location too long, can also become a pretty spectacular weapon. Something I think makes the Asgardians the Nine Worlds equivalent of the reigning “nuclear superpower,” and which Tony Stark and/or Nick Fury might be pretty uncomfortable knowing. The only other realm we get to see in any detail, besides Midgard (that’s us), is the Frost Giants’ home of Jotunheim. Kind of like a frozen Mordor, with very little in the way of structure or architecture beyond some wicked crags and ice-rimed boulders. Not especially memorable as a location, but the Giants themselves were fairly impressive. I quite liked King Laufey (Colm Feore), who gets a surprising amount of screen time. The effects are not quite as effective in service of the title character, however. 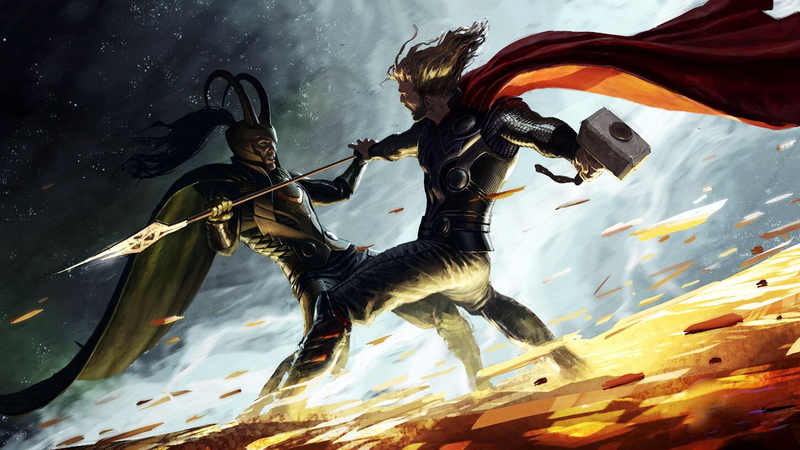 Thor himself has a lot of fighting and big, mighty mighty smiting to do with his little hammer, Mjolnir. By and large, when the action scenes are limited to melee combat, I’m happy with the way Thor’s weapon of choice is rendered. When compared to all the giant, overcompensative (is that a word?) weapons the other gods wield, Mjolnir is not really that eye-catching. It’s a grower, not a shower, as it were. The effects team give it a weight when it impacts that make up for its relative size. I wish we’d gotten much more badass weather effects than we did. With the exception of one battle the whole God of Thunder thing was kind of swept under the rug. A rainstorm, the stray flash of lightning, and that was about it. Hopefully in future Thor appearances we’ll get to see him really unleashed; show us some of those godworthy hundred-foot diameter lightning bolts that really FEEL like they can split mountains. The Thor effect I was least satisfied with were the hammer twirling and flying scenes. To be fair that’s always something that has sounded more impressive on the page than I think it can be visually represented. Basically he throws that hammer around all the time, bashing in Frost Giant skulls and such. To fly all he has to do is throw it but NOT LET GO, and he is towed along behind it. But when translated to live actors on screen it doesn’t quite work. Two other weak spots for me: the cinematography (by some guy named Dutch Angle?) isn’t as awe inspiring as I’d have hoped. But that’s a nitpick. The film’s score, however, is, if you’ll forgive me the pun, godawful! I’m not familiar with composer Patrick Doyle, but he missed a major opportunity here to do something truly sweeping and operatic. Wagnerian, even. Instead we get the Muzak, elevator version of an 80’s fantasy B-movie. It’s the only element of the film I’m completely bothered by. Okay, so I indulged a little when I titled this review ‘Mjol-Near Perfect’. I just couldn’t resist. But obviously the picture has it’s flaws. On the whole, Thor is a mostly rousing sword and sorcery (hammer and metascience?) epic that convincingly drops one of Marvel’s more bombastic and out-of-this-world characters into the already established “real world” of Iron Man and Captain America. Hemsworth’s arrogant and righteous Thor should be a fun mix with RDJ’s snarky and inebriated Stark. It remains to be seen how well Chris Evans’ Steve Rogers/Captain America will fit in between those two, but I can’t wait to see it. I trust in the power of Joss Whedon to craft some truly Shakespearean sturm und drang wit for that ensemble. Avengers Assemble! This entry was posted in Movie Reviews and tagged anthony hopkins, avengers, captain america, chris hemsworth, clark gregg, dutch angle, film, first avenger, heimdall, idris elba, iron man, jaimie alexander, loki, marvel, marvel comics, movie, natalie portman, odin, robert downey jr, stellan skarsgard, thor, tom hiddleston, tony stark. Bookmark the permalink.